Unlike Nick’s demo, I didn’t have much space between my pedestal and the wall, so removing the p-trap was virtually impossible. I thought the best course of action was to skip a few steps. The only way to make more room to remove the p-trap was to loosen the pedestal from the wall. I went ahead and cut the adhesive caulk from around the sink with a utility knife. Then I unbolted the screws from the wall. After, I cut around the caulk between the pedestal and the floor. Unlike the example in this YouTube video, the water source pipes in my pedestal weren’t malleable at all. Removing them from the shut-off took a considerable amount more effort. I realized this quickly, and I knew that I’d just have to basically yank the sink up with all my strength, then deal with the pedestal. I clearly didn’t have my thinking cap on, because I didn’t stop to think with the sink gone, there was nothing keeping the pedestal in place. 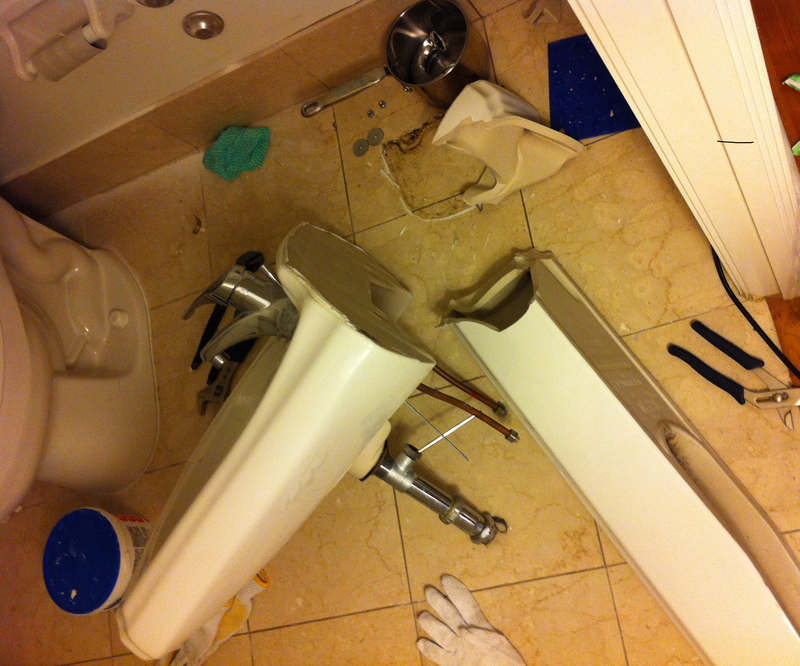 So, while I’m lifting this sink up, the pedestal is crashing down … directly on my right foot. I cannot describe the pain I experienced, other than to say I cannot remember experiencing that much pain in the last 15 years of my life. It hurt like CRAZY! My poor toes are still swollen 3 weeks later! And in addition to the hurt, I was just incredibly shocked! I couldn’t believe that out of all the places to land, it decided to land right where I was. And all this while I was still holding the sink, which easily weighed about 25 pounds (or at least if felt like it did). So now, I had to carefully place the sink on the floor to avoid hitting my other foot, or worse, hurting my right foot for the second time. After that, I booked it out of the bathroom, sat on the edge of my bed and let out a few controlled screams of pain. I’m tough so I didn’t cry, I just stared at my foot in absolute disbelief that this happened to me. I had a half-empty glass of soda water close by, so I poured it on my foot, then kept the foot elevated. About a half hour later, I got a bucket, filled it with cold water and dunked my foot in it every so often. I rested for about an hour and a half. The pain subsided a bit. It was hard to walk on my right foot, but it was good enough. I was so rudely interrupted by this calamity, but I had to return to the task at hand, so I was back in reno mode. I swept up the parts of the pedestal that broke and put them in a bag. I also lifted the pedestal, put it into my handy cart and hauled it to the recycling room. I came back to get the sink, which as I mentioned previously, was hella heavy. It was also too big to fit in my cart, so I placed a dismantled cardboard box under it, dragged it to my elevator and dragged it to the recycling room. I was so happy to see those two pieces go! 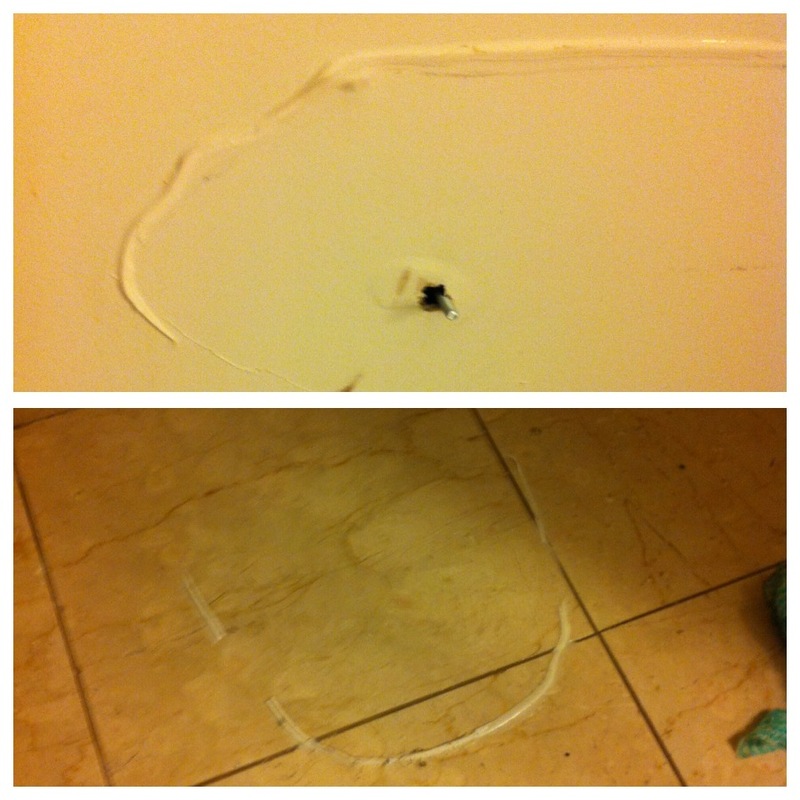 There was some caulking left on the wall and on the floor, so I scraped them off with a putty knife. My knife was plastic, but I wish I’d sprung for the metal one, because I think it would have done a better job. But with some serious elbow grease, most of it came off. The lesson I learned from this experience is to wear your protective gear. It took my two and a half weeks to be able to walk like normal. At press time, it’s been just over 3 weeks, and only now can I wear high heels again. Aside from the superficial aspect, I was lucky that I didn’t break or fracture any of my toes. So if you’re thinking of taking on a project like this, check your footwear before you wreck your toes! I wish I could do that to the guest bathroom at my paren’ts house! Very nice post! First time bumping into your blog in the WordPress community, I am kinda new here 🙂 let’s see if I can keep up w/ you now! Nice job. Thanks, I’m glad you like it! And who knows, maybe you’ll parents will come around! Welcome to WordPress as well!